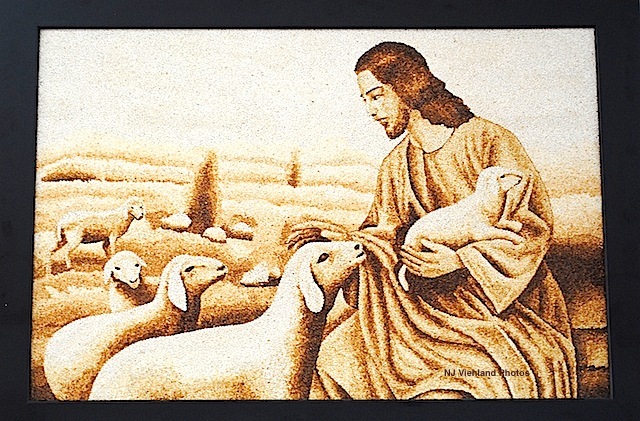 Xuan Loc, VIETNAM – This mural of the Good Shepherd made of rice grains hung in the dining room of the Pastoral Complex of the Diocese of Xuan Loc, in Dong Nai, Vietnam, when the Federation of Asian Bishops’ Conferences (FABC) officials gathered there with delegates and resource persons from around east, south, southeast and central Asia on Dec. 2012 for the Xth FABC Plenary Assembly. This year’s celebration of Lunar New Year on Feb. 19 pulls the mural photo out of Catholic in Asia’s media library because the Chinese Zodiac sets the date as the start of the “Year of the Sheep“ until Feb. 7, 2016, and sheep is one of the prominent symbols used in the Christian faith. Some of the earliest depictions of Christ show him as the Good Shepherd. At the same time, lamb also represents Christ as sacrifice (Paschal Lamb) and also a symbol for Christians. Jesus gave Peter a three-fold command to “feed my sheep” in John 21:15-17. Each time Jesus said, “Feed my sheep,” it was in response to Peter’s three-fold declaration of love for Jesus. The three commands, although often translated the same way, are subtly different. The first time Jesus says it, the Greek means literally “pasture (tend) the lambs” (v. 15). The Greek word for “pasture” is in the present tense, denoting a continual action of tending, feeding and caring for animals. Believers are referred to as sheep throughout Scripture. “For he is our God and we are the people of his pasture, the flock under his care” (Psalm 95:7). Jesus is both our Good Shepherd (John 10:11) and the Door of the sheepfold (John 10:9). By describing His people as lambs, He is emphasizing their nature as immature and vulnerable and in need of tending and care. The second time, the literal meaning is “tend My sheep” (v. 16). In this exchange, Jesus was emphasizing tending the sheep in a supervisory capacity, not only feeding but ruling over them. This expresses the full scope of pastoral oversight, both in Peter’s future and in all those who would follow him in pastoral ministry. Peter follows Jesus’ example and repeats this same Greek word poimaino in his first pastoral letter to the elders of the churches of Asia Minor: “Be shepherds of God’s flock that is under your care, serving as overseers” (1 Peter 5:2). The third time, the literal translation is “pasture (tend) the sheep” (v. 17). Here Jesus combines the different Greek words to make clear the job of the shepherd of the flock of God. They are to tend, care for, and provide spiritual food for God’s people, from the youngest lambs to the full-grown sheep, in continual action to nourish and care for their souls, bringing them into the fullness of spiritual maturity. The totality of the task set before Peter, and all shepherds, is made clear by Jesus’ three-fold command and the words He chooses. Pope Francis has also used the symbol of shepherd on various occasions. At his first Chrism Mass in 2013, he used the imagery to stress the need for priests to go out of themselves, reach out to their people in the name of Jesus, and also to allow their people to be media through which Jesus can touch and teach priests. A priest who seldom goes out of himself, who anoints little – I won’t say “not at all” because, thank God, our people take our oil from us anyway – misses out on the best of our people, on what can stir the depths of his priestly heart. Those who do not go out of themselves, instead of being mediators, gradually become intermediaries, managers. We know the difference: the intermediary, the manager, “has already received his reward”, and since he doesn’t put his own skin and his own heart on the line, he never hears a warm, heartfelt word of thanks. This is precisely the reason why some priests grow dissatisfied, become sad priests, lose heart and become in some sense collectors of antiques or novelties – instead of being shepherds living with “the smell of the sheep”, shepherds in the midst of their flock, fishers of men. 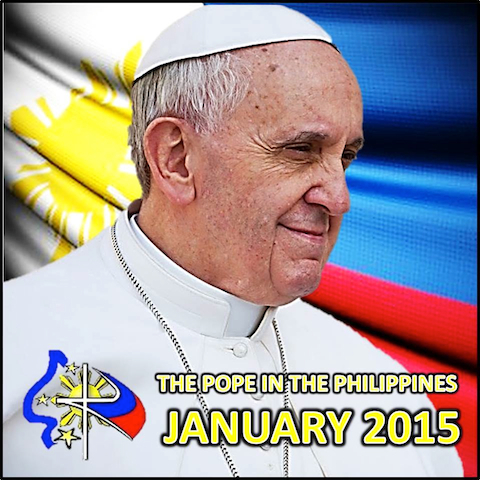 And so it is along these lines of Scripture and Pope Francis’ message to priests that we wish families in and from Asia celebrating Lunar New Year of the Sheep : may prosperity, peace and justice reign in everyone’s lives and in the world through our sacrifices, mercy, compassion and full pastoral care from our Church. Recently appointed Vietnamese Auxiliary Bishop Joseph Dinh Duc Dao of Xuan Loc Diocese, while serving as rector of the diocese’s Saint Joseph Seminary last December addressed delegates and participants of the Xth Federation of Asian Bishops’ Conferences (FABC) Plenary Assembly during a cultural program held in the diocesan pastoral complex. The Federation of Asian Bishops’ Conferences (FABC) is an association of conferences of bishops of Catholic Churches in South, Southeast, East and Central Asia. The federation fosters solidarity and joint responsibility for church and society welfare in the region. The conference includes sixteen Bishops’ Conferences from Bangladesh, East Timor, India, Indonesia, Japan, Kazakhstan, Korea, Laos-Cambodia, Malaysia-Singapore-Brunei, Myanmar, Pakistan, Philippines, Sri Lanka, Taiwan, Thailand and Vietnam. Churches in places where there are no bishops’ conferences have been included as associate members, including Hong Kong, Macau, Mongolia, Nepal, Novosibirsk (Russia), Kyrgyzstan, Tajikistan, Turkmenistan, Uzbekistan. FABC gathers in plenary in various countries, and the 2012 assembly was the first to be held in a country under communist rule. Two months after the FABC plenary assembly on Feb. 28, Pope Benedict appointed Monsignor Dao auxiliary bishop for Xuan Loc. He was the last bishop appointed by Benedict XVI before he stepped down as pope. Bishop Dao said the presence of FABC delegates “… reminds us of our responsibility to share with other brothers and sisters in Asia the joy of faith in Christ.” Less than 3 percent of the population in most countries in Asia are Catholics. The presence of Filipino Cardinal Gaudencio Rosales as special envoy for then Pope Benedict XVI , along with Archbishop Savio Hon Tai Fai, secretary of the Congregation of the Evangelization of Peoples and Archbishop Leopoldo Girelli, resident representative of the Holy Father to Vietnam “connect us to Rome and the Holy Father, and through the Holy Father with the whole Church,” Bishop Dao said. 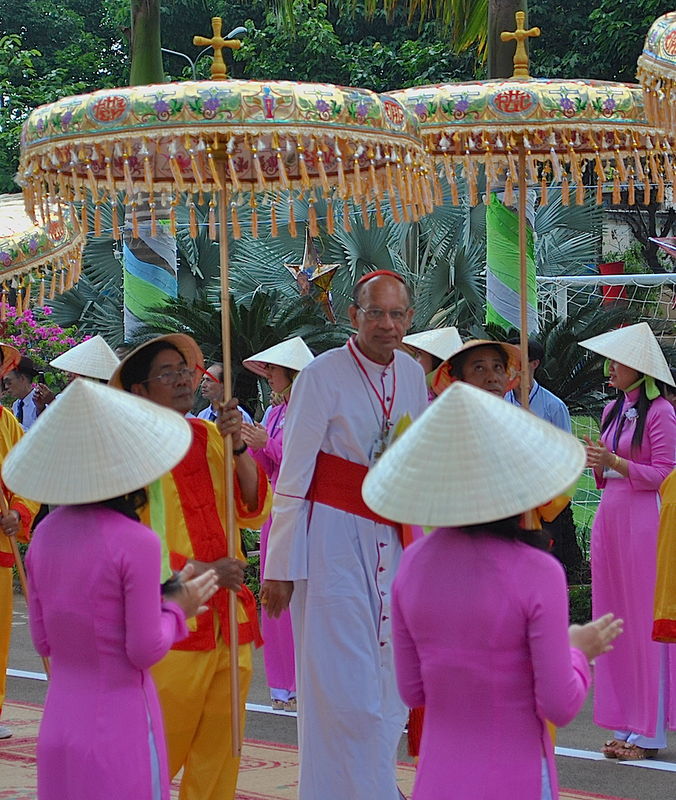 In response, Cardinal Rosales promised bishops, priests, religious men and women and lay members of the Vietnam Catholic community gathered for a cultural presentation in the diocesan pastoral complex in Xuan Loc that he would convey their message of faith, love and loyalty to the Church and to Rome. FABC’s top official Cardinal Oswald Gracias is the only Asian among the eight cardinals named by Pope Francis to work on reorganizing the Roman Curia. 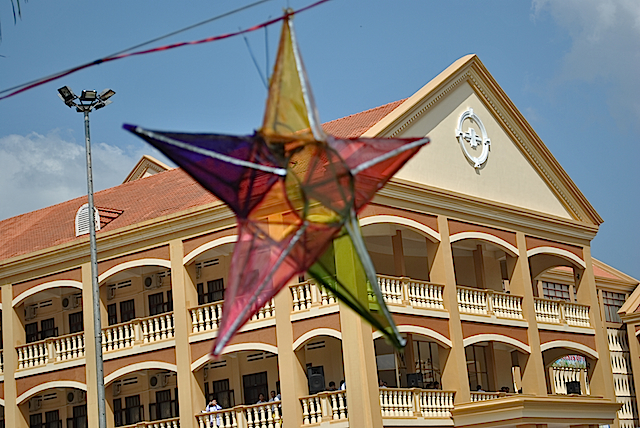 Vietnam Monsignor Vincent Dang Van Tu, vicar general of Xuan Loc said the diocese’s hosting of the 10th Plenary Assembly of the Federation of Asian Bishops’ Conferences (FABC) was a wish come true for Xuan Loc officials. 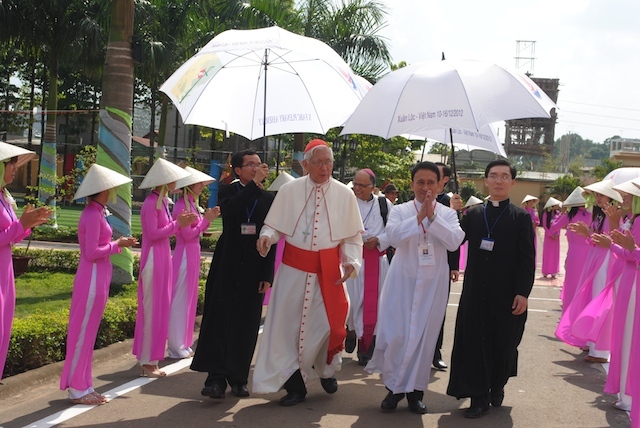 Cardinal John-Baptist Pham Minh Man of Ho Chi Minh broached the idea of hosting the gathering of Church leaders from around Asia four years ago when he inaugurated the buildings in Phase I of the construction plan for the Xuan Loc Pastoral Centre complex east of Ho Chi Minh City. In an interview on Dec. 14, Monsignor Tu retold the story of the pastoral center that housed more than 100 plenary assembly delegates, staff and guests who were attending meeting and workshop sessions, and praying together during the assembly of bishops of Asia that took place from Dec. 10-16.